​Through Infinite Love, a registered 501(c)(3), Andrea continues to tirelessly fundraise and advocate on behalf of childhood cancer research and the families that childhood cancer effects. She travels to give speeches in an effort to raise more awareness, has been covered by national media sources, was the Executive Producer on the award-winning music video “Fighter,” and has been the recipient of the “Point of Light” award and the “Innovators Award” (from BioNJ). While fundraising is a huge part of Andrea’s day-to-day life, she is also deeply involved in the pediatric cancer community on a personal level as she makes herself available to oncology parents all hours of the day. Today, Andrea’s daughter Natalie is a healthy 8-year-old child and loves nothing more then lazy days playing with her big sister, and childhood cancer advocate, Hannah Rose. While Andrea acknowledges the luxury of her daughter’s survival, there is no going back to the life that she once knew prior to Natalie’s diagnosis as she’s seen too much. “Natalie’s fight might be over, but until there’s a cure for these kids our fight will never stop.” Click here to learn more about Natalie's journey. began receiving treatments at Memorial Sloan Kettering Cancer Center and the family invested in creating hope. ​The challenge with hope is that it can inspire, it can help to create change, it can be a gift that one person can give to another, but it cannot kill cancer. Mia had hope until the end, all of the McCaffrey’s did and they still do now. Rachael Kanapka has experienced childhood cancer from a different perspective. Her younger brother David was diagnosed with thymoma at at 8, in 1988. Despite multiple courses of radiation and chemotherapy, as well as surgery to remove a cancer-ridden lung, David passed away in 1992 at age 12. ​About 15 years later, after working in the marketing world for Boston-area startup Upromise, Rachael traded in the office to be a full-time mom in 2006 when her twins Anna and Kate were born. They were soon followed by a third daughter, Ellie, in 2009. Not long after, Rachael, her husband Bob, and their three girls moved back to her childhood hometown of Middletown, NJ. 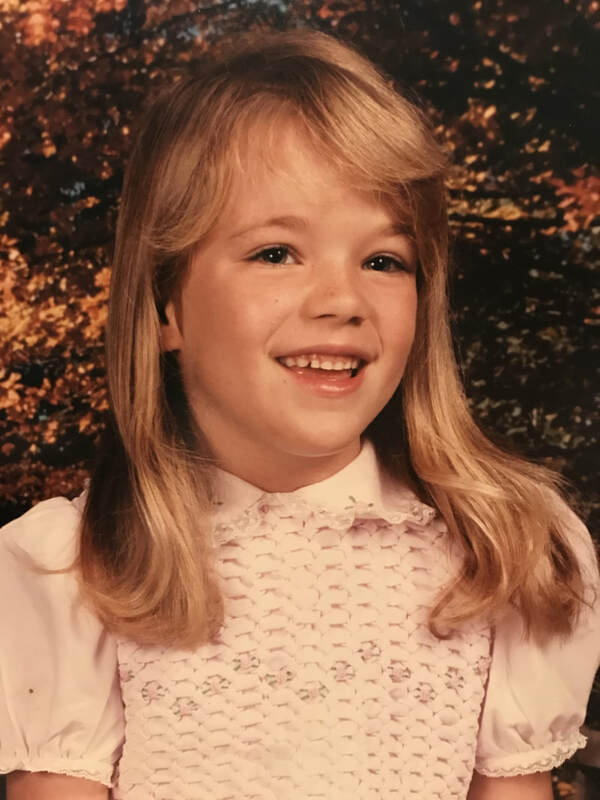 When her two oldest daughters were in first grade, Rachael saw Hannah Gorsegner's name on one of their class lists. She recognized her as the sister of Natalie Grace, the local childhood cancer fighter she had heard about and donated to. Rachael reached out to Andrea, explained her own connection to childhood cancer, and offered to help. She started by running some fundraisers at the girls' elementary school, and bit by bit became more involved with Infinite Love. ​ the construction of a dangerous and unjustified high voltage power line that would have caused multiple devastating consequences to their community, including increased risk of leukemia and other health issues for people living nearby. Rachael is proud to put her marketing background to work for Infinite Love, to honor her brother David by helping childhood cancer fighters survive to reach adulthood like they deserve, and like he should have. Jeana was raised in Middletown, NJ and earned her Bachelor of Science in Physical Therapy from Quinnipiac College (now Quinnipiac University) in Hamden, CT. She has worked as a physical therapist at Riverview Medical Center, part of the Hackensack Meridian Health System, since starting with them in 1996. She is a Certified Lymphedema Therapist and is part of the team working to establish an oncology rehabilitation navigation program at Riverview Medical Center to better serve the local oncology population. In 2007 an ad for St. Jude's stating "be thankful for the healthy children in your life and give to those who are not" hit home after a brief leukemia possibility tied to another diagnosis arose with her youngest child. When the opportunity to work with Andrea and Infinite Love for Natalie Grace arose, she has been involved ever since. Her many years of experience working on her children's school fundraisers has given her experience in event planning and fundraising coordination that continues with her role with Infinite Love For Kids Fighting Cancer. ​Megan is a mother of two girls (Sam and Kate) and lives in Middletown, NJ. She has a BA in Business and Technical Writing from the University of Delaware. She entered the workforce in 1995 at the dawn of the Internet age as a Project Manager for a small Marketing firm that developed web-based applications for financial firms. She also worked in marketing with an Internet Service Provider and as an e-Commerce Producer with Kenneth Cole Productions, Inc. She is currently a Project Manager with Business Edge Services and Technologies. Megan has been a volunteer in the Middletown Schools for over 10 years and has enjoyed working with Infinite Love for Kids Fighting Cancer for over three years. She hopes that someday soon there will be a day when children won’t have to suffer this terrible disease. Steve is a recent addition to the Infinite Love team and has helped us (to say the least) secure our 501(c)(3) status. He is a life long native of Middletown where he currently lives with his wife Kristin and two daughters (Sabrina and Audrina). He has an accounting degree from Rider University, a Masters in taxation from Seton Hall and is a CPA. He is also the Treasurer of Residents Against Giant Electric (RAGE), a grassroots nonprofit group challenging the construction of hazardous transmission lines through parts of Monmouth County. As a matter of fact, it was through this fight that Steve and Infinite Love met. After he heard about Infinite Love from a speech Hannah had given at a RAGE public hearing about the links between hazzardous EMF’s and childhood cancer on children and her sister Natalie’s fight he introduced himself and wanted to learn more about what Infinite Love represented. Luckily for us he liked what he heard and asked if we were in need of a Treasurer (which was the very role that we were trying to fill at the time). His first act was to establish us as a recognized 501(c)(3) with the IRS...check and check! Susannah is a native of Marblehead, MA. She studied graphic design at Skidmore College in Saratoga Springs, NY and launched her career as a designer at PlutoMedia (Patrick Mitchell's Rockport, MA studio) where she designed publications such as Tango, Success, Cooking Light, Kiplinger's, DirecTV, Nylon, 02138 and Brides: Honeymoons and Weddings Away. After art directing at Boston Magazine and its subsidiaries (Boston Weddings, Boston Home and New England Travel) Susannah moved to NYC to design at O, The Oprah Magazine and Women's Health. She is currently the Design Director at Cosmopolitan. Throughout her career, Susannah's work has been recognized by the Society of Publication Designers. Freelance clients have included Sterling Point Books, US Sailing, True North Yachts, Sparkman & Stephens Yacht Design, and UKHalsey Sailmakers. Linda was raised in South Philadelphia before moving to New Jersey at 21. She is a mother to three amazing adult children (Jason, Jeremy and Andrea) whom she considers her friends and her greatest life's achievement. Most of Linda's career was working at Rohm and Haas Specialty Chemical Company in Philadelphia. Here last position was as a Tax Specialist in the International Tax Dept. She retired in 2007 to become a full-time "Giggy" (AKA grandmother) to help care for her "bevy of beauties" (AKA granddaughters) Madison, Isabella, Gabriella, Hannah, and Natalie. These days, Linda is an avid advocate for Childhood Cancer raising awareness and raising funds for research. Infinite Love for Kids Fighting Cancer, Inc., is 100% volunteer based and is a registered 501(c)(3) corporation.